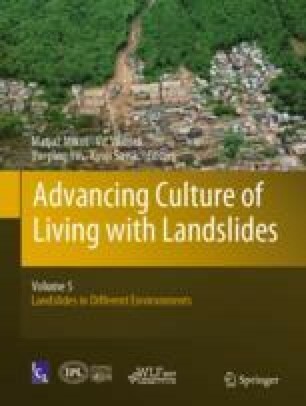 Urbanization in hazardous regions, the abandonment of rural and mountain areas, and changed agricultural and forest practices have increased the impact of landslides through the years. Hence, the changing climate variables, like rainfall, acted and will act on a human-modified landscape. In this work, we analyze the role of rainfall variation and land use/cover change in the occurrence of landslides in Calabria in the period 1921–2010. Combining rainfall and landslide information, we reconstruct and analyze a catalogue of 1466 rainfall events with landslides (i.e., the occurrence of one or more landslide during or immediately after a rainfall event). To investigate the impact of land use/cover changes in the occurrence of landslides, we consider the “Land Use Map” made by the Italian National Research Council and the Italian Touring Club in 1956, and the “CORINE Land Cover” map released in 2000. Since our landslide catalogue is at municipality scale (i.e., for each landslide we known the municipality in which it occurred), we attribute a prevailing land use/cover class to each of the 409 municipalities of Calabria. We split the catalogue in two subsets (1921–1965 and 1966–2010) and correlate the landslides occurred in the first period to the 1956 land use and the landslides occurred in the second period to the 2000 land cover. We find that: (i) the geographical and the temporal distributions of rainfall-induced landslides have changed in the observation period; (ii) land use/cover in Calabria has changed between the two periods, with a huge decrease of arable land and an increase of heterogeneous agricultural areas and forests; (iii) in both periods, most of the landslides occurred in areas characterized by forests and arable land; (iv) in the second period, there was an increase (decrease) of landslides occurred in agricultural areas (arable land). The “Centro Funzionale Multirischi” of the Agenzia Regionale per l’Ambiente della Calabria (ARPACAL. www.cfd.calabria.it) made available the rainfall data. The CORINE Land Cover Map released in 2000 was acquired from the Italian National Geoportal (www.pcn.minambiente.it). We are grateful to Paola Giostrella who was precious for finding and gathering the CNR-TCI land use map of Calabria.